Executed in 1944. This work is number one from an edition of six. A. Drexler, "Calder," Interiors, vol. 109, no. 5, December 1949, p. 84 (another example illustrated). Cambridge, New Gallery, Charles Hayden Memorial Library, Massachusetts Institute of Technology, Calder, December 1950-January 1951 (another example exhibited). New York, Perls Galleries, Alexander Calder: Bronze Sculptures of 1944, October-November 1969, p. 10, no. 8 (another example exhibited and illustrated). Palm Beach, Hokin Gallery, January-February, 1970 (another example exhibited). Turin, Palazzo a Vela, Calder: Mostra retrospettiva, July-September 1983, p. 106, no. 80 (another example exhibited and illustrated). 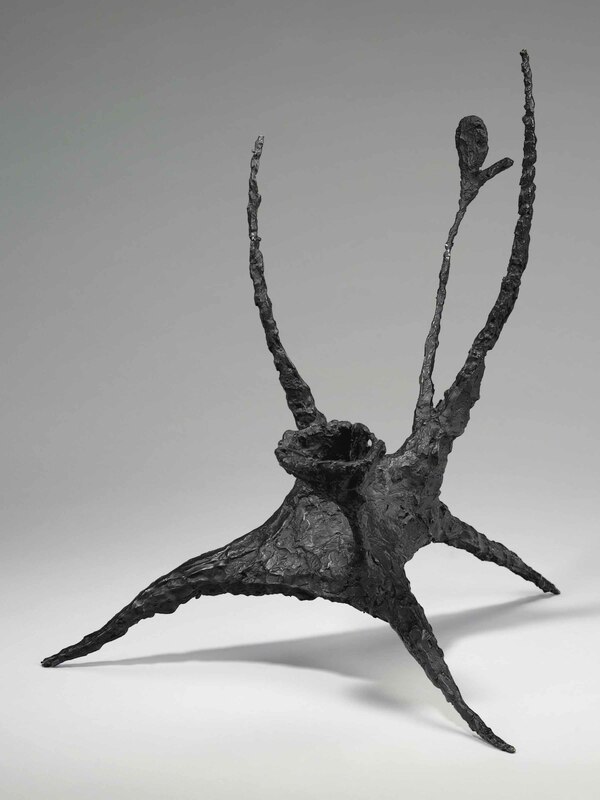 New York, Pace Gallery, Alexander Calder: Bronzes, March-April 1987 (another example exhibited). St. Moritz, Galerie Gmurzynska, Le Cirque Calder Commence, February-May 2008 (another example exhibited). Zurich, Galerie Gmurzynska, Alexander Calder, April-May 2008 (another example exhibited). New York, L&M Arts, Calder: The Complete Bronzes, October-December 2012, p. 54-55, no. 19 (another example exhibited and illustrated in color). This work is registered in the archives of the Calder Foundation, New York, under application number A01140.1. Alexander Calder first experimented with bronze in 1930 in a series of small, toy-like figures, reminiscent of Cirque Calder, 1926-1931. He returned to the medium again in 1944 with a series of twenty-four bronze sculptures. These works, along with their plaster counterparts, were exhibited at Curt Valentin's Buchholz Gallery in New York in the fall of that same year. The Flower, highlights Surrealist influences on Calder in this series, while at the same time, exhibits his customary exploration of balance and movement. It claims its space as an object; standing on three, sharply- pointed splayed legs while a lone blossom perches on one of its upward reaching tendrils. The delicate lines emanating from its raised center of gravity, in contrast to the primitive, organic modeling of its form, engender The Flower with a sinewy vitality as the biomorphic elements culminate in a balanced, abstract whole. Immediately following his retrospective at The Museum of Modern Art, New York in the fall of 1943, Calder began to distrust the ease with which he handled his familiar materials of wire, sheet metal and wood. According to James Johnson Sweeny, "He was afraid this facility would weaken his expression," (Alexander Calder, New York, 1951, p. 59) and he sought a means to disrupt a process that, for him, was in danger of becoming habitual. At the same time his friend, the architect Wallace Harrison, suggested he focus on abstract forms to create large scale, outdoor, concrete sculptures. As Calder recalls, "He (Harrison) apparently forgot about his suggestion immediately, but I did not and I started working in plaster" (Alexander Calder: An Autobiography in Pictures, New York, 1966, p. 195). These events initiated this series of bronzes as a means for Calder to return to the "primitive, rather than decadent art," (in Manuscript), Calder Foundation, New York, 1943); unleashing his creativity in this traditional yet unfamiliar medium. The sculptures were cast by Roman Bronze Works Inc., of Corona New York, with the help of Sculpture Services, New York, and, indeed, Calder himself. While he found it "disagreeable to have to check the manipulations of some other person working on the objects at the foundry," (Alexander Calder: An Autobiography with Pictures, New York, 1966, p. 195) remarkably, it is Calder's own manipulations that present themselves. The hand of the artist is distinctly present in the modeled and rough surfaces of The Flower. In October of 1968, Calder rediscovered 18 of the original 24 bronzes of the 1944 series in his mother's home in Roxbury, Connecticut. He authorized a strictly limited edition of six numbered, bronze casts, of which, the present work is numbered one. The artist stated, "Bronze, cast, serves well for slender, attenuated shapes. It is strong even when very slender," ("A Propos of Measuring a Mobile" (manuscript), Archives of American Art, 1943) and Calder's The Flower was given new life to be appreciated for its superb balance of strength and delicacy in the medium uniquely equipped to express it.